Email callback is a variation of the web callback. However, instead of entering a web page, an end user sends an email with the account credentials (login and password) and two phone numbers: a phone number where the user can be reached and the destination number he wishes to be connected with. He then receives the call and is connected with the destination number provided in the email. The advantage of this type of callback is the availability of making calls in places where users are not permitted to browse the web, but can still send and receive emails (e.g. in some office environments). 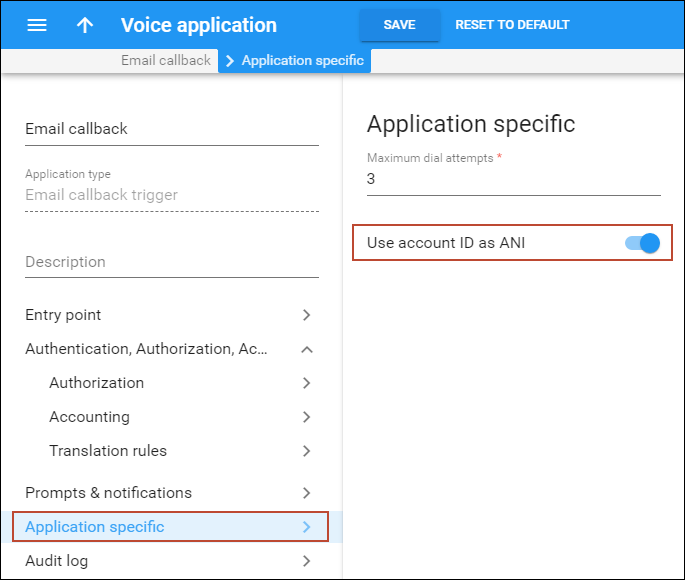 This chapter demonstrates how to configure and use email callback. A user from Poland needs to call his relatives in Germany. He sends an email providing both his phone number and that of his relatives. He receives a callback and is connected with Germany. Follow the steps described in the Setting up Callback Services. General Configuration handbook that describes the initial instructions for configuring callback services. Email callback means that users can send emails to a special email address (e.g. callback-request@yourdomain.com) with the domain name of the PortaSIP® Media Server. Make sure you have created an MX (mail exchanger) record for this domain name. · Name – specify the name (e.g. Email callback). · Application type – choose Email callback trigger. 1. 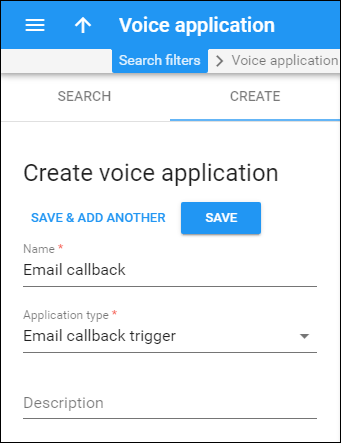 On the Voice application panel, go to the Entry point panel and specify Callback email address. This is the email address for the web server where end users send emails to initiate callback calls in this format: callback-request@<host> where host is a domain name of your PortaSIP® Media Server. · On the Accounting panel, specify the access code that will allow the PortaBilling® to use a special tariff for callback charging. For email callback the default access code value is EMAILCALLBACK. Enable the Special charge if LegB fails option to use a special tariff to charge for legA if a call to a destination number (legB) cannot be established (e.g. if the destination number is busy or not answering). 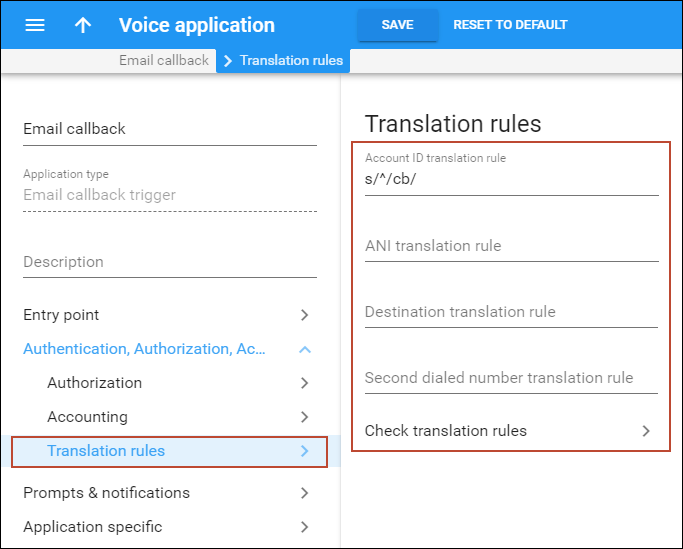 · On the Translation rules panel, put a cursor into Account ID translation rule field and specify the translation rule as a Perl expression that will convert the number of the calling party. This rule will be applied to the number if the option Use account ID as ANI is selected. 3. 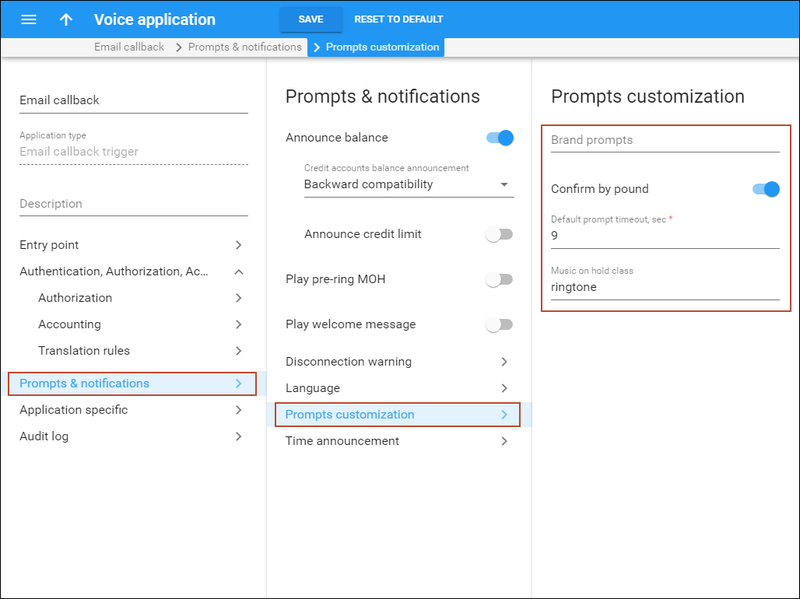 On the Prompts & notifications panel, go to the Prompts customization section and specify the folder name with your custom IVR prompts. These prompts will be used instead of the default ones. Please refer to the How to… section for a detailed description of how to upload and use custom IVR prompts. 4. On the Application specific panel, enable the Use account ID as ANI option to show the account ID (i.e. PIN) as the calling number. Now it is necessary to create a tariff according to which your customers will be charged for using the callback services. 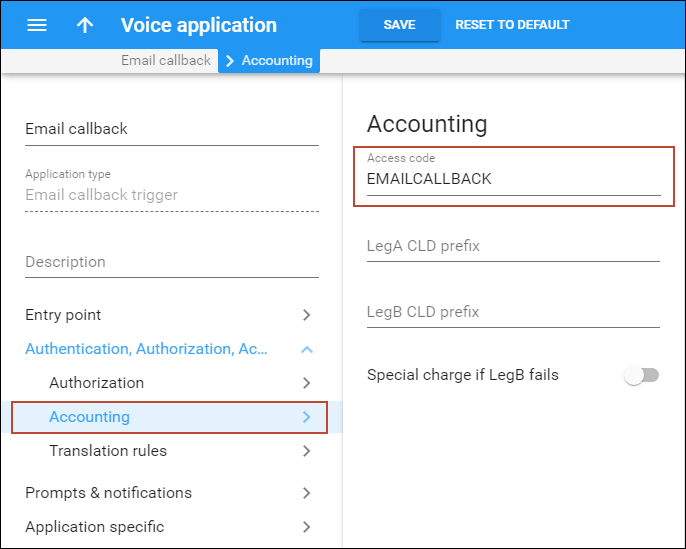 A callback call consists of two parts (call legs): a call to the calling party (legA) and a call to the destination number (legB), therefore this tariff will be used to create charges for both call legs. The total charge for the entire callback call is the sum of charges for call legA and call legB. · Name – Type a short name for the tariff object; this is the name you will see in the select menus, (for example, Callback). NOTE: You can charge separately for call legs. Please refer to the How to… section for a detailed description of the necessary steps for setting that up. Since a callback call consists of two call legs, rates for both call leg destinations need to be entered into the tariff. 1. On your customer tariff’s panel (Callback), click Rates. · Destination – Select a destination prefix from the list or type it directly, (e.g. 33 for France). 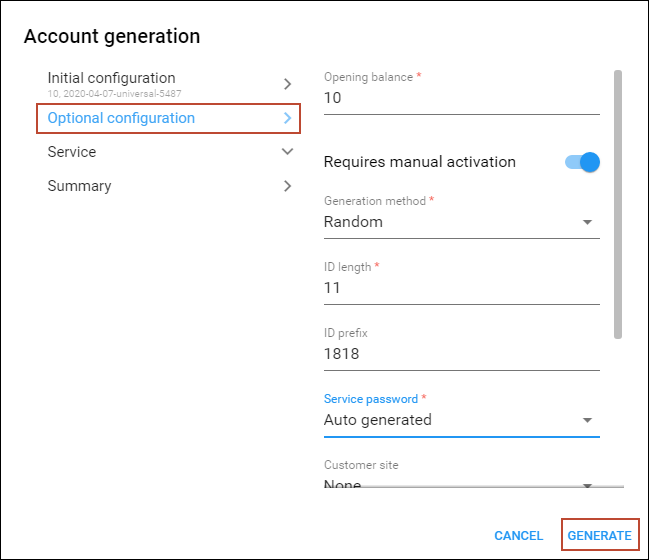 Accounts for accessing callback services have a specific product assigned to them. Products are powerful tools that define different ways for billing accounts. Product definition is always done using these steps: product type definition, service definition and configuration and creation of a rating list. · Account role – Select Universal from the list. · Access code – Type in the EMAILCALLBACK access code here as it was specified in the Email callback trigger instance above. You can also leave this field empty and the system will automatically select this tariff when charging for Email callback services. 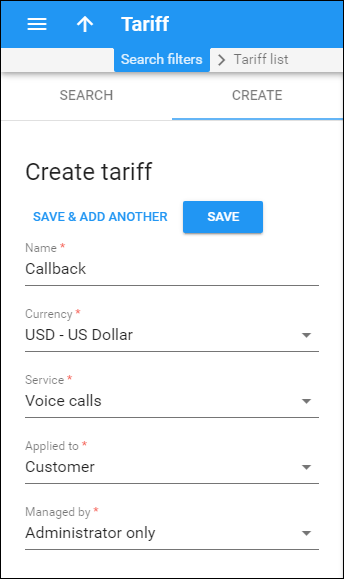 · Tariff – Select the tariff that will be used to calculate the charges for callback calls. 1. Click Add to enter another rating entry. This rating entry will define what tariff should be selected if one of the call legs fails to be established (e.g. the destination number is busy or not answering). · Access code – Type in the CALLBACK_FAIL access code here. 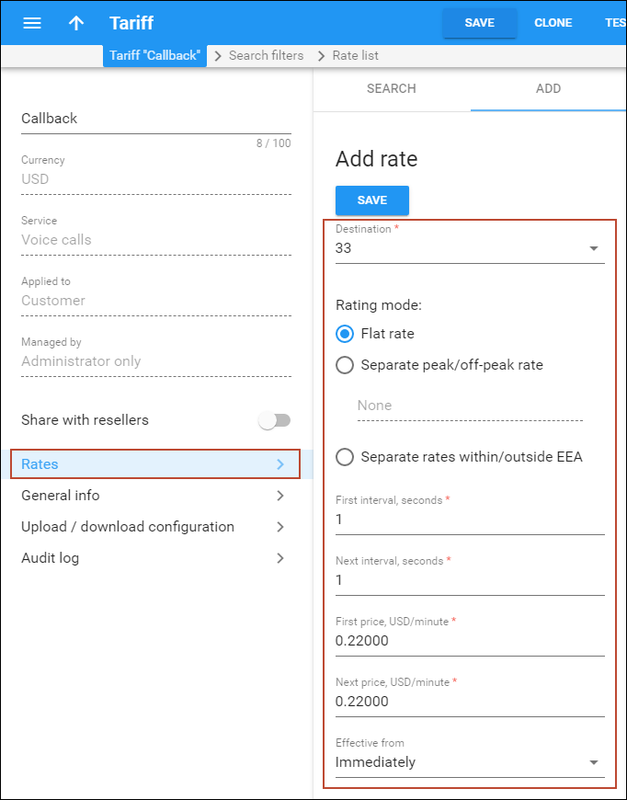 · Tariff – Select the callback tariff for unsuccessful calls. NOTE: You can use a special tariff for this rating entry (e.g. if you do not charge your customers for unsuccessful calls to destination numbers, create a separate tariff and enter a rate of zero for a “|” wildcard destination in it). Find the description of the tariff creation and rates enter in the sections above. A customer owns their accounts. 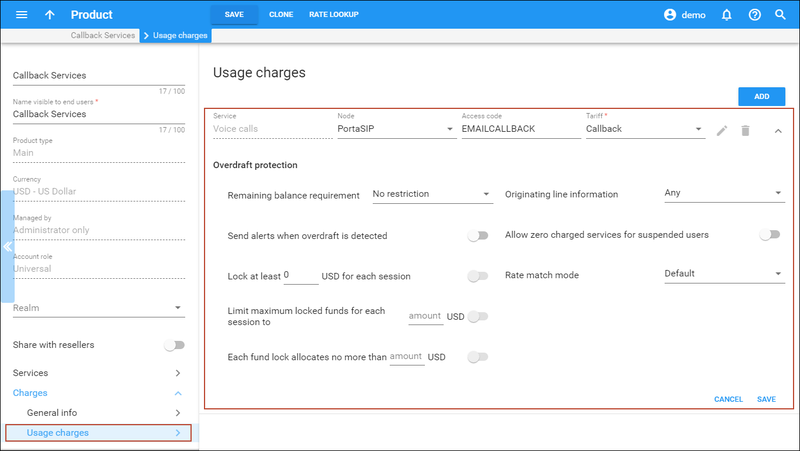 As a rule, Callback is provided as a prepaid service, so invoices are not issued. However, you will still need at least one customer object in order to keep all the accounts organized in one location. · Customer class – Customer class allows you to define a policy for automated payment collection. By choosing a specific class here the customer will automatically inherit all of the class properties (grace period, invoice template, etc.). · Balance control – Select Postpaid. · Credit limit – Specify the credit limit value for this customer. NOTE: Before generating accounts for a production system, read the Provisioning Prepaid Accounts section of the Prepaid Calling Cards handbook. · Account role – The defined usage for the account. Select Universal from the list. · Type – Select Debit. 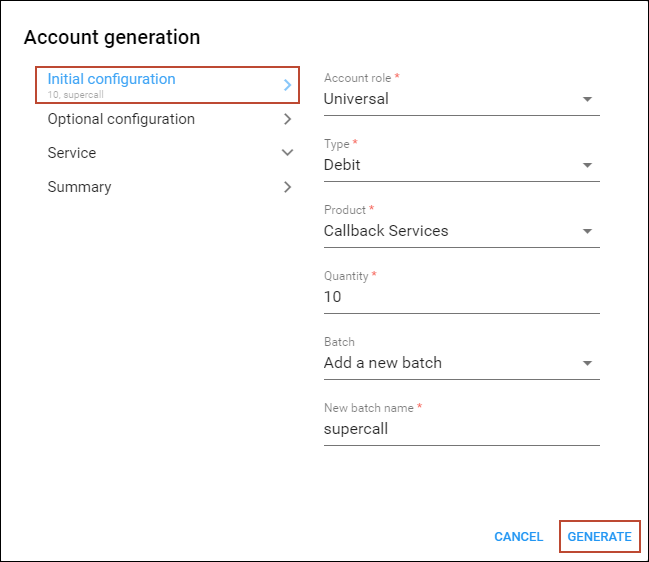 · Quantity – Number of accounts (callback cards) to be generated. · ID prefix – If you would like all of the generated accounts to start with the same digit string (e.g. 1818), enter it here. Thus, if you enter 1818 and an ID length of 10, account IDs (PINs) will look like this: 1818NNNNNN, where N = random digits. · Service password – To improve security, you can use the complete account information, i.e. account ID and password, for authentication in an email callback. Click Auto generated so that service passwords are automatically generated. · Distributor – You can assign a specific distributor to this group of accounts. o Activation date – The date from which the account is usable. o Expiration date – The date that the account expires. o Availability period after first usage, days – Defines the number of days the account remains active after its first use or recharge. o Availability period after last usage, days – Defines the number of days the account remains active after its last use or recharge. o Credentials – If you choose Auto-generated, your customer will use his account ID (PIN) to login to the self-care pages; a random password for web access will be assigned for each account. If you choose Empty, the account owner will not be able to use the self-care pages at all until a login has been assigned for his account; no password will be assigned, so account owners will be able to login to the web interface simply by providing their account ID (PIN). o Time zone – When an account owner accesses the web self-care pages to see a list of his calls, the time will be shown in the time zone most appropriate for him. o Web interface language – The language to be used on the account self-care web interface. In case the original email message is lost or accidentally deleted, the file containing generated accounts is stored on the slave PortaBilling® server in the user /porta_var/<Server_IP>/ directory, sub-directory cards. Create an email and send it to the email address specified in the email callback trigger instance (e.g. callback-request@mydomain.com). · Subject – Type in Callback. NNNNNNNN is the destination number. 3. Wait for a call to your phone number.